seawapa.co: BOMBSHELL: US Caught Meddling in Russian Elections! What would Americans say if they found their polling stations and certain political parties entirely infiltrated by Chinese money, Chinese observers, and Chinese-backed candidates promoting China's interests in an AMERICAN election? The answer ranges from incarceration, to trials featuring charges ranging from fraud, to sedition and even treason with sentences ranging from decades to life in prison, perhaps even death, as well as possible military action for what could easily be considered an act of war. The New York Times in its article, "U.S. Groups Helped Nurture Arab Uprisings," clearly stated as much when it reported, "a number of the groups and individuals directly involved in the revolts and reforms sweeping the region, including the April 6 Youth Movement in Egypt, the Bahrain Center for Human Rights and grass-roots activists like Entsar Qadhi, a youth leader in Yemen, received training and financing from groups like the International Republican Institute, the National Democratic Institute and Freedom House, a Non-profit human rights organization based in Washington." The Times would continue by explaining, "the Republican and Democratic institutes are loosely affiliated with the Republican and Democratic Parties. They were created by Congress and are financed through the National Endowment for Democracy, which was set up in 1983 to channel grants for promoting democracy in developing nations. The National Endowment receives about $100 million annually from Congress. Freedom House also gets the bulk of its money from the American government, mainly from the State Department." These same NGOs have also just recently played a central role in Laos and Myanmar by corrupting the Communist Governments, blocking the construction of a mega-dam that would have begun the development of the nation's rural areas, provided electricity for export and domestic use, and helps irrigate surrounding agricultural land. These NGOs are currently creating a social divide in Thailand to subvert an 800 year old independent political institution that has for centuries, weathered Western encroachment. There is also documented evidence of these NGOs attempting to destabilize the government of Malaysia and reinstall IMF minion Anwar Ibrahim back into power. In Russia's neighboring country and ally, Belarus, this network of US-funded NGOs have attempted to start a "Belarusian Spring" to overthrow leader Alexander Lukashenko, who has adamantly opposed NATO's creep toward its, and Russia's borders. And now Russia itself has just rooted out a plot by these very same NGOs creeping in and around the nation's political institutions, in an attempt to subvert and replace them. This is not the first time Russia has faced this insidious creep from abroad. After the fall of the Soviet Union, there proceeded a lawless free-for-all where foreigners began rushing in, in an attempt to create their own order out of the chaos. Leading this charge was billionaire oligarch Mikhail Khodorkovsky who fashioned an "Open Russian Foundation" and even had western corporate-financier elitists Jacob Rothschild and Henry Kissinger chair its board of directors. In a now all too familiar scenario, Khodorkovsky and his networks of foreign-funded NGOs attempted to consolidate and transfer Russia's wealth, power, and the destiny of its people into the hands of Wall Street and London's global "corporatatorship." 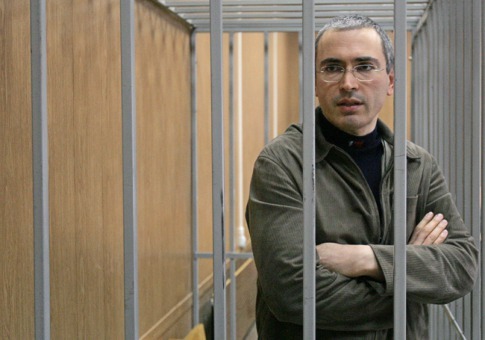 Image: Khodorkovsky, safely behind bars. In Russia, Wall Street and London's mafia banksters go to prison. Russia, however, was not entirely defenseless. In a devastating backlash, Khodorkovsky was thrown into a Siberian prison where he remains to this day, while other oligarchs serving Western interests scattered like cockroaches back to London and New York. 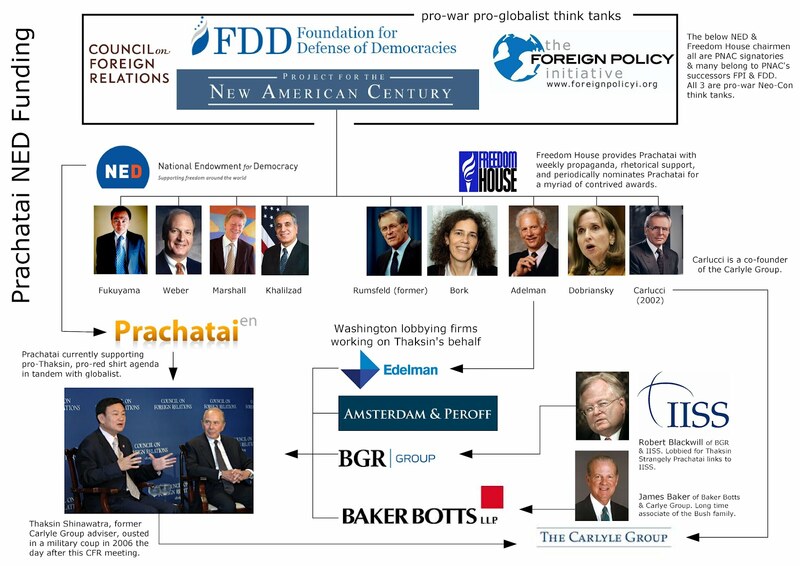 In a hollow attempt to portray Russia's efforts to preserve its national sovereignty as "human rights abuses," Wall Street and London assembled a legal defense led by globalist lawyer Robert Amsterdam, who while still representing Khodorkovsky, is also defending another loser in Wall Street's game to place their puppets in positions of power around the globe, Thaksin Shinawatra of Thailand. Most recently, as Russia's elections approach, AFP has claimed that NGOs such as US NED-funded Golos and New Times' slon.ru, which regularly features columns by the now jailed and above mentioned Khodorkovsky, were attacked in order to prevent the exposure of "mass election fraud." Why opposition groups and foreign-funded NGOs who have a direct vested interest in preventing Putin's United Russia Party from obtaining a clean victory at the polls, should be trusted to reveal "mass election fraud" in the first place, is never quite explained by AFP. NED's official website lists an astounding number of meddlesome NGOs conducting activities across the Russian Federation that no American in their right mind would allow on US soil. Golos is just one of many NGOs funded by the United States government, overseen by the US Embassy in Russia, and used to meddle in the sovereign internal affairs of their nation. AFP reported, "Prime Minister Vladimir Putin, whose United Russia party has won Sunday's polls but with a reduced majority, has denounced non-governmental organisations like Golos, comparing them to the disciple Judas who betrayed Jesus." And indeed, Golos is certifiably betraying the Russian people by taking foreign money and pursing a foreign agenda, masquerading as "pro-democracy" crusaders. Golos' activities, mirroring those in the US-engineered Arab Spring, include an online "Map of Violations" site detailing "claims" of fraud across Russia, in an attempt to undermine the legitimacy of upcoming elections Putin and is party are predicted to easily win. Golos' Liliya Shibanova described their "Map of Violations" project as being a place where people could upload any information or evidence of election violations. This, being far from actual evidence, again mirrors the same tactics of manipulating public opinion in the midst of uprisings around the world, fueled by identical foreign-funded organizations where baseless claims of abuse, violence, and "human rights" violations made up the entirety of accusations then used by Western governments to diplomatically and militarily (in the case of Libya and now Syria) pressure targeted nations. As in Belarus, where the vice president of NED-funded FIDH, and ring leader of foreign-funded sedition within the Eastern European country, was imprisoned for over 4 years, in Russia, the government is openly exposing the enemy by name. This has also happened in Malaysia, where the ruling government has outed the "Bersih Clean and Fair Elections" movement as a conspiracy of foreign-corporate-financier interests aimed at destabilizing the country and installing a more favorable, proxy regime led by IMF minion Anwar Ibrahim. Russia would also wisely turn their attention to the US Embassy and recently confirmed Ambassador Michael McFaul, who serves on the board of directors of Freedom House and the National Endowment for Democracy, both now implicated in directly interfering in Russia's sovereign affairs. Photo: Michael McFaul, confirmed in November as US Ambassador to Russia, immediately set out to work, not to represent the interests, aspirations, and good will of the American people, but to execute the agenda of corporate-financier oligarchs, who in October sang praises regarding his accomplished background in foreign agitation and the possibilities his presence in Russia could yield. It also should be noted that McFaul is a Senior Associate of the Carnegie Endowment for International Peace, fully funded by the Fortune 500, Soros' drug cartel Open Society, and other corporate-funded foundations. "The Brookings Institution recently published a “letter of recommendation” of sorts for McFaul, titled, “Give the Next Russian Ambassador a Powerful Tool to Guard Human Rights.” Already out of the gates, the article is disingenuously using the concept of “human rights” to leverage US interests over Russia. Written by Brookings’ own arch-Neo-Conservative Robert Kagan and Freedom House President David Kramer, the piece begins by immediately calling on the US Senate to confirm McFaul. As if to alleviate any doubt regarding just what Brookings means by “human rights abuses,” Kagan and Kramer then cite the case of UK financier operative Sergei Magnitsky of Hermitage Capital Management, an enterprise that while operating primarily in Russian markets, maintained its headquarters in the Cayman Islands. Magnitsky was arrested and imprisoned over tax evasion and tax fraud, and would die of illness while in prison. The US and UK would predictably trump up the circumstances surrounding the death of Magnitsky, with corporate foundation-funded Redress (page 28) of the UK submitting a “report” to the UN in yet another classic example of leveraging issues of “human rights” against a target nation to serve Western interests controlled by the British Empire. This is but a taste of what is to come with McFaul presiding over the next leg of Anglo-American global destabilization. By exposing both McFaul’s true “credentials” and intentions, as well as who he really works for and why, and by systematically boycotting and replacing the consumerist troughs that fuel this corporate-financier oligarchy we can rectify this obvious and ever-expanding divergence between what is best for America and what is pursued by the oligarchs that presume dominion over us." Russia and a growing number of other nations are openly exposing and holding accountable agents of sedition operating in their country, sent and funded by US tax payers' money. It is time for the other shoe to drop, and for the people of the West to hold their governments accountable. As targeted nations begin exposing and jailing members of this global conspiracy, likewise the West must begin exposing the disingenuous peddlers of this agenda - namely the board of directors and trustees organizing these ploys and dolling out the funds used in this global destabilization, and hold them duly accountable for using tax payers' money to fund political chaos abroad while economic and social decay consume Americans and Europeans at home.